My assumption about Oklahoma State this coming season was that they’d recover from losing Mason Rudolph and James Washington just fine since those two have been starting for three years now, giving OSU plenty of time to develop back-ups. The WR situation this past year year was insane for OSU because in addition to returning James Washington they also had 2016 MOTP Jalen McCleskey, 5-star transfer WR Tyron Johnson, big Marcell Ateman returning from injury, and emerging young Dillon Stoner. 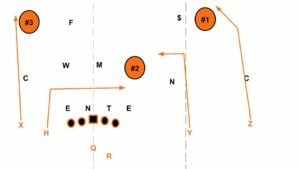 As I’ve noted in the diagram, this play really put teams in a bind with three areas of the field where the defense probably needed a numerical advantage to guarantee success. The first of course is the post route to James Washington, there wasn’t a CB in the league that you wanted to trust to defend that sucker without help. The second was on the shallow cross and dig routes in the middle of the field. If you were leaving your safety deep to help on the post, which you should, then it made it that much harder to effectively cover both the dig and the shallow. If the LBs didn’t match those really precisely then the Cowboys could hit one of their speedy inside receivers on the move. Finally there was Marcell Ateman, the 6-4, 220 pound freak, running a go route on the backside and Rudolph often throwing to his back shoulder. Washington had 1544 yards at 13.2 yards per target and 13 TDs in 2017. Ateman feasted on single coverage with 1156 yards at 13.3 yards per target and eight TDs. Then McCleskey and Stoner had 647 and 576 yards apiece with McCleskey gaining 9.8 per target with five TDs and Stoner 10.1 with six TDs. Oh yeah, and Justice Hill still ran for 1467 yards and 15 TDs. Washington and Ateman are both gone now but OSU’s middle of the field triumvirate of Hill, Stoner, and McCleskey are all back and Tyron Johnson is probably ready to build off his solid 2017 debut (293 yards, 10.3 ypt, three TDs) on the outside at the X or Z receiver position. The Cowboys also return “cowboy backs” (both are really FBs) Britton Abbot and Sione Finefeuiaki) to help run the ball and set up play-action. Even if they can’t overstress opponents from four-wide next season it seems likely that they could still get up to their normal tricks running play-action and setting up dig-post or other concepts for Tyron Johnson outside or one of their inside guys running vertical. The question for 2018 OSU was who the trigger-man would be and whether they could protect him without either of 2017’s starting OTs returning. Again, my assumption was that OSU would have plenty of options at QB behind Rudolph and that the biggest issue would be finding tackles. Gundy may have seen things differently, or else he saw an opportunity. In addition to being a modern day “Reggie Cleveland all-star,” Dru Brown is your archetypal star Big 12 QB. Hawaii listed him at 6-0, 200 but I’d venture a guess that he’s closer to 5-10 or 5-11. The 200 is probably legit, he has a stocky build, and he’s mobile, crafty, and plays with a chip on his shoulder. I don’t know if Brown had any opportunities coming out of high school other than the JUCO route. His 247 page suggests that he was a relative unknown and then he picked up interest after a strong freshman year at San Mateo JC. My Google powers tell me that Los Gatos is an upscale town up in the bay area where Netflix is headquartered. Anyways, the kid has taken an aggressive path in finding opportunities first enrolling early at San Mateo to learn their triple option O after running the I in high school, then leveraging a strong freshman year into the Hawaii offer, then two solid years and a degree from Hawaii into an opportunity to start at Oklahoma State. He’s obviously pretty bright given that he won the starting jobs at his last two spots in his first year and it’s also apparent from film that he understands and processes the game at a high level. The word on him I’ve seen is “not a huge arm but very savvy” which is basically what everyone said about Baker Mayfield. The parallels to that lowly recruited, undersized, but highly confident signal-caller are…really strong to say the least. Like Mayfield, Brown has a much better arm than the scouting report you’re reading in the wrap-ups about him. Here he is doing some pre-snap diagnosis on Wyoming using the fake clap to try and draw out the look zipping a comeback at the sticks for a first. The boundary comeback isn’t the hardest throw in the world but he obviously isn’t missing any needed velocity or placement here. Another nice throw to the boundary, reading star safety Andrew Wingard and zipping the ball in on a skinny post, if he can do this on an RPO that’s money in the bank. The second time went down as an incomplete because the hit you see SS Andrew Wingard (amazing player) inflicting here knocked the ball loose. Still the recognition, placement, and timing are all pretty nice. Brown is also a solid thrower on the run and pretty mobile in general. “Poor man’s Baker Mayfield” isn’t the worst comp, maybe a middle class man’s Baker Mayfield is a little closer to the truth. He’s good at processing the field before and after the snap and has enough zip and accuracy to be plenty dangerous. A Dru Brown OSU offense? I don’t know if Brown is can push the ball down the field in the same way that Rudolph did, particularly on the post routes to Washington that often went over the heads of safeties that were deep down the field. As I’ve noted above his arm strength was solid but he’s not a guy for just throwing it over everyone’s head all the time. Instead, I’d expect a Dru Brown-led OSU offense to make more use of their dangerous inside WRs, particularly on the slot-fade routes that are becoming so popular these days. Stoner and McCleskey have shown they can be very effective running vertical routes up the seams and Brown has the ability to recognize and hit those kinds of routes. 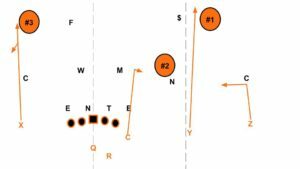 With Brown’s ability to navigate the seams it’s possible for OSU to draw up designs in which the vertical from the slot receiver sets the stage to stress the whole field just as they did when they had speedy Washington and big Ateman outside. Now that he’s locked in with a big contract at OSU, Gundy is aiming to compete every year and with a strong offseason 2018 could prove more opportune than 2017. Enjoyed the read I think a lot of people look at the stats and dismiss this transfer but from watching the Wyoming and Nevada game I came to a similar opinion of Brown (middle class Mayfield). The oline for Hawaii really handcuffed a group of pretty good skill position players. They spent most of the 2 games I watched way behind schedule due to sloppy penalties. I think one thing slightly overlooked in this article is that even though Brown isn’t a runner the threat of him running could open up the Okstate offense. The read option would seem to be a bit more dangerous with Brown as the QB threat compared to Rudolph. To me if you are helping Justice Hill even a little with the threat of a QB run the results could be huge. I noticed him running some but I’m not sure he’s a better runner than Rudolph, who was deceptively solid for a such a tall dude. Tate has more upside than does Ateman but also is a bit rawer at this point. I wouldn’t have a problem switching them and taking Tate early in the third and Ateman here.